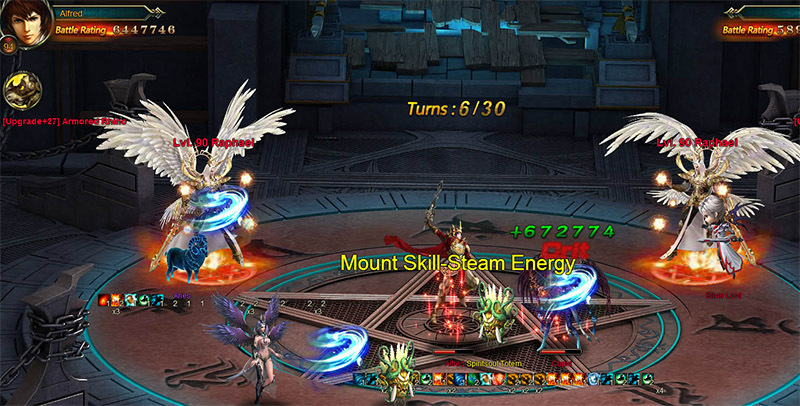 North America Forum»Forum ›League of Angels ›General Discussion › opponents HP goes up after attack? opponents HP goes up after attack? I am trying to figure out how this happens. As you can see from the screen shot, my opponent\'s HP is going up, not down, upon attack. I have checked his equipment, his dragon souls, his awaken skills, and his aegis. None of these indicate HP increase upon attack. I know it happens in cross server team tourney, but I have not otherwise seen it in clash of might. And as you can see, my BR is higher than his. Any ideas? still need battle log if possible. ;;;; I am trying to figure out how this happens. As you can see from the screen shot, my opponent\'s HP is going up, not down, upon attack. I have checked his equipment, his dragon souls, his awaken skills, and his aegis. None of these indicate HP increase upon attack. I know it happens in cross server team tourney, but I have not otherwise seen it in clash of might. And as you can see, my BR is higher than his. Any ideas? that is your life that goes up , when you attack a enemy you get 12 % HP upon attackin , from what i can see in that picture you attacked him and received 620 k HP , even if the HP shows above the enemy that HP is added to your character . so that is not a bug unless you can prove otherwise and show a battle log . But anyway I have figured out the answer. He is using the Sylph power unbending will which has a chance of increasing health when being attacked. lol main character cant use sylph. lol, I know, but I have no other explanation. Have the same thing against 1 enemy often where it looks like nereida stun me, but in in fact his claw DS skill stunning me. 2019-4-21 18:50 GMT+8 , Processed in 0.071650 second(s), 50 queries .